Freed Slaves and Land Ownership research papers show the importance of land ownership when slavery was abolished in the South. Although the Emancipation Proclamation had officially outlawed slavery in the U.S., many southerners tried to prevent the former slaves from gaining their independence. It became vital for the former slaves to own land in order to gain economic freedom and independence. Many freed slaves continued to work on white plantations for wages, while others were able to purchase land and gain a true sense of independence. More than four million slaves had been freed after the Civil War, and for many, land ownership was a critical aspect of their freedom. Congressman Thaddeus Stevens proposed giving each "forty acres and a mule," to ensure their independence and survival. According to some, there was evidence that the slaves may have to fight for their freedom again if they were not given land. Stevens suggested that the only solution was to "make them independent of their old masters, so they may not be compelled to work for them on unfair terms," which, as noted above, was already taking place. However, Stevens was in the minority, and even the Freedmen's Bureau compelled former slaves to work for wages on plantations owned by white southerners. 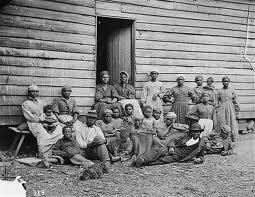 The freed slaves struggled for independence after the war. With assistance from Stevens and others in the Reconstruction movement, they became educated, held political office, and by 1879 owned ten percent land. Despite many obstacles, some blacks gained a greater sense of freedom and independence. Unfortunately, many also remained dependent upon white plantation owners after the Civil War. Underground Railroad - Underground Railroad Research Papers discuss the ways in which African Americans escaped slavery. Jim Crow Laws - Jim Crow Laws research papers discuss the law that imposed severe restrictions on African Americans, including limits on their individual rights and strict segregation laws. Order a research paper on the Jim Crow Laws from Paper Masters. Robert E. Lee - Robert E. Lee Research Papers look at the life of one of the military's great commanders. Abraham Lincoln and the Civil War - In the summer of 1861, John C. Frémont proclaimed martial law in Missouri and declared that the slaves of any civilian found carrying arms would be freed. The Battle of Antietam - As a desperately needed Union victory, it allowed Abraham Lincoln to issue the Emancipation Proclamation. Battle of Antietam. Life of Frederick Douglass - It can easily be argued that Douglass is the most interesting autobiographical writer in history, as his life was one of struggle, oppression, privilege and prosperity. Dred Scott - After moving first to Missouri, and then Louisiana (where slavery was legal), Scott sued for his freedom. Abolitionist Movement - Abolitionist Movement research papers and custom essays outline the anti-slavery movement in America. Paper Masters writes custom research papers on Freed Slaves and Land Ownership and show the importance of land ownership when slavery was abolished in the South.